It’s always so lovely to hear from past clients and to hear of the news that they have had another baby. When I heard from this lovely family, telling me the news they had twins, I was beyond excited for them. I was also beyond excited to be asked back to their family home to do their Newborn Twins Photography Lifestyle Session. When I arrived at their family home, I was greeted by two “big brother’s” that I’d previously met two years ago. Mr 5 hadn’t changed a bit (only in inches). I could see within seconds, he still had bounds of energy (well actually more), like he had the last time I met him. Mr 2, well he had changed and grown so much. He was just a newborn baby the last time I met him. He now was a partner in crime for his bigger brother and their bond was clear, right from first glance. They guided me in to see their new baby brother and sister, their little proud faces told me they were pretty excited to have another two siblings to play with, torment a bit, cuddle a bit and soon they’d all be running through their house with bounds of energy. Right now, they were so peaceful, and innocent, but with these two boys to show them the ropes in life, I don’t know how long that peacefulness will last for. 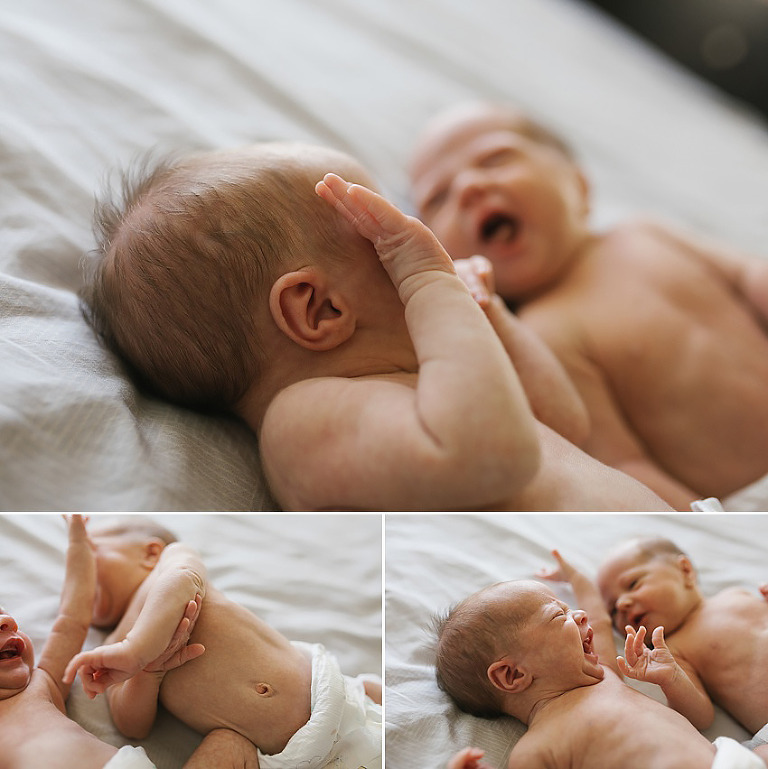 So while their baby twins were still so sleepy and peaceful, I decided to photograph them as they were to start with. Meanwhile getting plenty of assistance from Mr 5 and Mr 2. Once it was time for their feed, I asked the boys to help me wake them up. They were adorable, they were so soft and gentle with them. Proving to me even more so, they were proud as punch of their little comrades. Once fully awake and vocal cords clearly in-tact, Mum and Dad took the twins to a quiet place to be fed and I stayed with those noisy boys to play with them. They remind me so much of my own boys, extreme energy, which meant I had to keep up with them. They had me on the bed, under the bed, under the kitchen table and dancing in the kitchen, we had a blast together. My cheeks were sore from laughing so much, I think their’s were too. Then once the twins were fed and calm, we continued the session with such a beautiful family, filled with love and a beautiful connection. It’s for these reasons I love Lifestyle Photography. I let the session run the way it suits each family. I embrace chaos and celebrate it. It’s because of this relaxed setting, that the real moments of connection and love shine through, nothing is forced. What a beautiful way to remember such a special time in your family’s lives. If you would like to book your Newborn or Family Lifestyle Photography Session in, please feel welcome to contact me. © 2019 Natural Sutherland Shire Family and Newborn Lifestyle Photography|ProPhoto Custom Blog|Design by Northfolk & Co.